Will there be faction/guild approval, disapproval, fame, or infamy tracking? If so, any bonuses, perks, or penalties tied to those? Will there be new, readable in-game books? QUEST RELATED books? Will weapons/armour need to be repaired? Can they be upgraded? Any details? What will set apart from other MMOs? Combat, quests, storyline, lore? First of all, I would like to express how cool I think it is that Zenimax is doing this. I proffer my invisible hat. Will it have the full repertoire of classic TES 'junk items' lying about in the world, or will the world be kept to a more MMO-like smoothness? The PvP element will be taking place in Cyrodiil, I hear. Will the good old villes a la Oblivion (as they were circa 2E, of course... Kvatch, Anvil, Bravil, etc.) be incorporated? Will we be visiting any Daedric realms in the game? Molag Bal is the main antagonist of the "main quest", so to speak, and he's trying to drag Tamriel into his realm. It's almost a certainty that we'll be going into Coldharbour. I hope they use mine. No mainstream media outlet is going to ask about lore and books. Everyone will ask about spears and horses and things like that. Of course not. Because after all, it's just a game. Why would you get that invested in a video game? Nerd. my only question is will the game be lore freindly or in other words will stay in lore set by main elder scrolls or its completey different. Walk always in the light or i will drag you into it. It's canon. The devs are making a noticeable effort to stay true to the current lore. I'd definitely like to ask about how classes work; specifically, does everyone still have access to the same skills and perks, or are they limited by class? Or to put another way, do classes limit what you can get, or simply provide you with some starting skill points and perks to get you going? Obviously synergy across your abilities needs to be a focus, but in Skyrim it's balanced by the fact that you'll struggle against enemies at your own level if you went too far towards jack-of-all-trades. I'm also interested about what guilds will be like, i.e - fighters guild and mages guild etc., will these be present as things you can join as diversions, or is it just player factions? What about the Dark Brotherhood, and more importantly, any Dark Brotherhood assassinations in PvP? Lastly, to what extent is the game instanced? Given that it uses this "megaserver" concept I assume players are shunted off onto different physical machines as soon as possible, but social areas and PvP zones must have more dedicated locations where you can always see other players to meet up, and presumably meeting points for group dungeon delving. But when you're just exploring and looking for quests, are there still other players running around or can that experience be your own without disruption, with the landscape appearance changing as you complete quests? On NPCs: How much detail should we expect? Do they have the schedules, unique dialogue and backstories they've had previously, or was their role minimized to encourage interaction between players? I'm wondering about endgame, dungeons and such. Will there be endgame grinding to get the sickest skins (like bosses having a very low drop rate on a unique and great looking item) or does it have a system like in GW2 which gives you tokens and you have to do X amount of runs to get your desired item? Is there a tracking system where you might be able to find/ follow friends or alliances in the game world? Is there a fast travel system? How are they dealing with artifact economies/ camping? Are ruling factions capable of fortifying Cyrodiil? How are assault and defensive campaigns conducted? What are some of the common and upper level powers/ equipment players can look forward to? Is there a maximum encumbrance? Will the player be capable of supernatural transformations? With Bal in the picture, Vampires ought to be a major component. Others include Liches and lycanthropes. Is water explorable? How are they dealing with terrains? Are large bays and seas explorable? If assassin factions exist, are we killing enemy faction members? Does this suggest the ability to venture in enemy territories? They are not instruments of justice nor vengeance. They're target practice. For people that use BOWS AND ARROWS a lot, and we know that TES: Online is going to be 3rd Person only, how will the BOW aiming work? How do you plan on keeping players immersed in the story and atmosphere? With multi-player that will more than definitely be an issue. 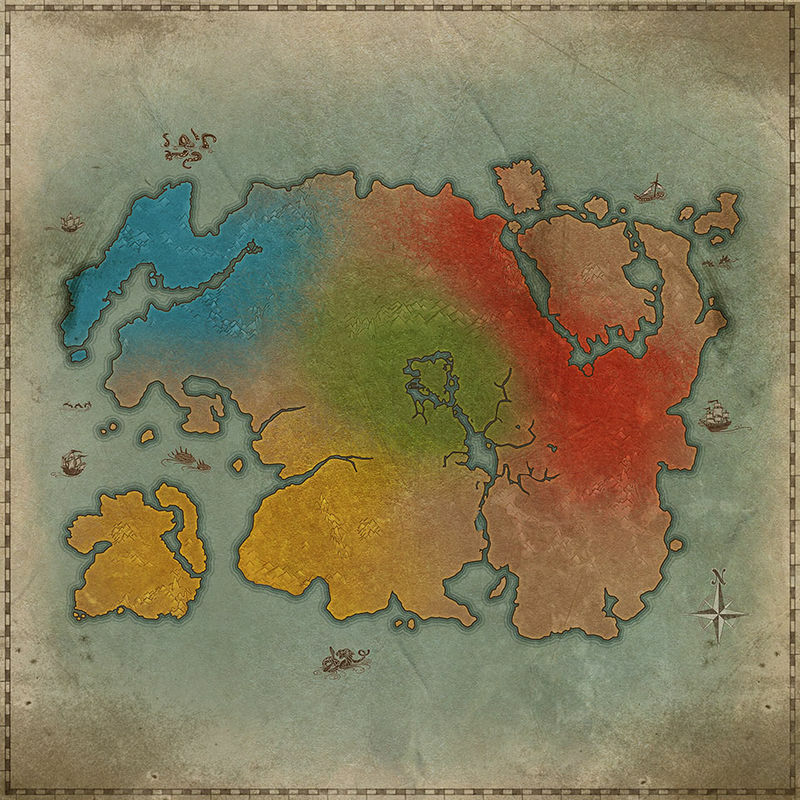 Based on the map of Tamriel on the UESP Elder Scrolls Online page, will we be able to travel to any location in Tamriel? Last edited by alonestalker on Tue Nov 27, 2012 1:55 am, edited 1 time in total. ...English isn't your first language, is it? --There will be player housing. There will be mounts, but I don't think they said anything about mounted combat. Once a faction has conquered all of Tamriel, and had a member crowned as Emperor, will there be a period of peace, or can the factions get right back to warring? Why is the Aldmeri Dominion a playable faction in 2E 583 with the Khajiit as a member when the Aldmeri Dominion wasn't founded until 2E 830 with the only members being the high elves and the wood elves? Given that lore is being overlooked will there also be a Mage's Guild as Stros M'Kai despite it not being chartered until 2E 638? Why was 2E 583 chosen when the story elements and factions shown would have made more sense in perhaps 2E 853 thereby also giving access to the wonderful quests that could surround Tiber Septim? How is the server system going to function? Will there be servers dedicated to PvP, PvE, or Roleplay? Will there be multiple servers or one mega-server as I've been informed? If there is a mega-server, will there be a problems for example, having it crash so that every player will be unable to play? It is the beginning of the end; for so it is with all things. How closely have you worked with Todd Howard and the Bethesda team? Will you be able to switch between 1st and 3rd person view like in SKYRIM? SKYRIM+ MORROWIND+ OBLIVION+THE DARKNESS//+ALICE MADNESS RETURNS=BEASTEALITY!!!!.... I MEAN WHAT?